This week I am starting a special review series that will probably take me a while to finish. 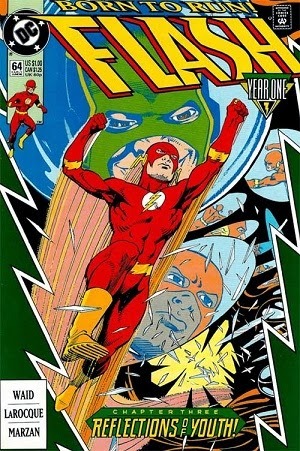 I have decided to read the Mark Waid run on the Flash and review what I read over the week. I will break down the issues as I read them and at the end I will do a review of the run as a whole. 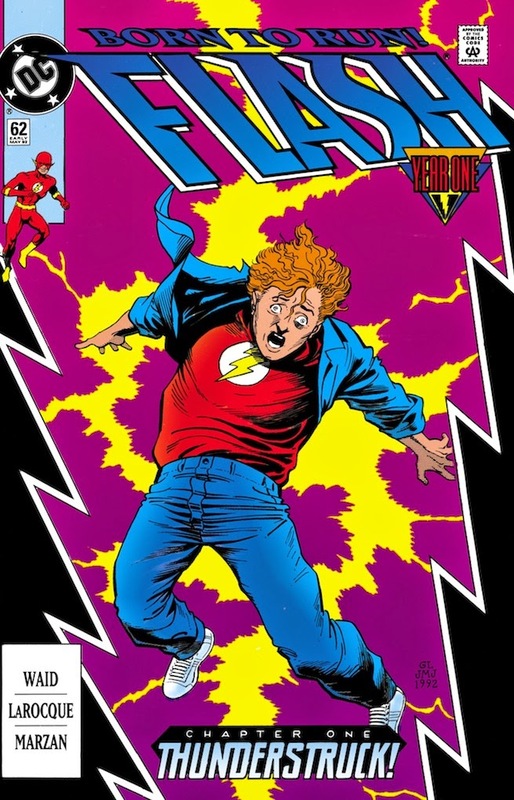 The first four issues of Mark Waid’s run on the Flash covers the story of how Wally West became the Flash in a storyline called “Born to Run”. 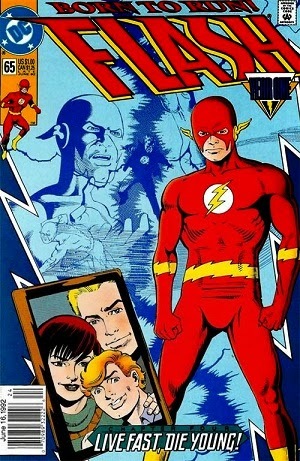 But it doesn’t just show his backstory only, it frames it with Wally in present day going through his Aunt Iris’ stuff and finding old scrapbooks for Barry Allen as the Flash and Wally as Kid Flash. Waid really makes Wally’s story interesting. 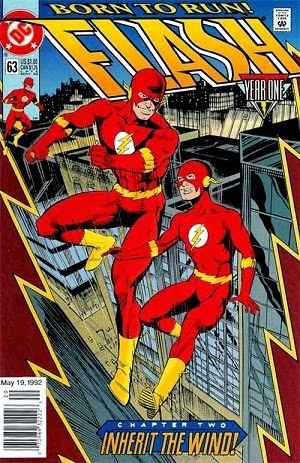 Not just introducing the reader to Wally West and his hero/mentor Barry Allen, but really breaking down who Wally is at that age and why he is who he is. A lot of that has to do with his Aunt Iris, who is the only person that Wally feels understands him. Wally comes from a borderline abusive family. Not really being physically beaten, but it does come off as being a emotionally and maybe even verbally abusive household. The only part of Wally’s origin that really bothers me is that they have him get his powers in the exact same way that Barry got his. I felt that really cheapened the character of Wally at first. But as the story evolves Waid manages to correct that slight misstep by having the powers actually having a large negative effect on Wally’s younger body. This leads to Wally having to stop using his powers, because the use of the powers could kill him. But after Wally returns home to his parents at the end of the summer he and his father are caught in the path of a tornado and his father is pinned under a fallen tree, after Wally runs away from home in a total stupid kid throwing a temper tantrum moment. 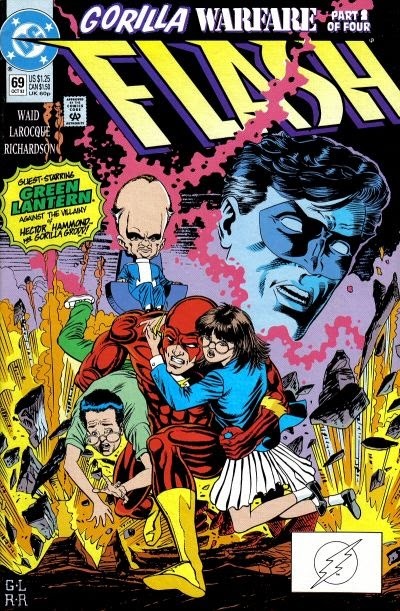 This forces Wally to make the decision of they both die, or Wally could use his speed to stop the tornado and save his father, but dieing in the process. I think we all know that Wally doesn’t die of course, but the moment still has a great dramatic feel, and by Wally really pushing himself to stop the tornado he breaks through the “ceiling” of his powers in his young body and reaches his full potential. Issue #66 is a one off issue with the guest artist Michael Collins. In this issue Barry is on a cruise with a female friend that is hijacked by a pod of whales and taken to a secluded island where the Aquaman villain the Marine Marauder is trying to dig up some ancient oceanic artifact that would allow her to control the seven seas themselves. I have never even heard of the Marine Marauder before, and thats probably for the best. She is a mohawked villain with the power to control sea life. And her powers apparently even have the ability to control Aquaman himself. So when Wally comes to, he finds that all of the other passengers are being forced to help move rocks from the entrance of a cave said to contain the crown. The Marine Marauder makes Flash a deal. If he helps her move the rocks and find the crown she will release all of the people she has been enslaving to help her. Of course Wally agrees and begins to help her. And with his speed it isn’t long before Aquaman and the Flash find a large ornate antechamber containing a single chest inside. but when Flash opens the chest Aquaman steals the crown and places it on his own head, revealing that it wasn’t the Marauder’s powers that he was under the influence of but the original owner of the crown the storm god Enlil. And by placing the crown on his head Aquaman is fully possessed by the ancient Babylonian god. After quite the battle Flash is able to knock the crown off the head of Aquaman and restore his friend to normal. But as Wally saved him the god was bringing in tsunami’s from all angles that would completely drown the entire island. Using his speed force Wally is able to hide all of the people inside the cave and cover the entrance with stones before the waves hit. Everyone except the Marauder who, in her greed stayed outside to save the crown so she could rule the seas. 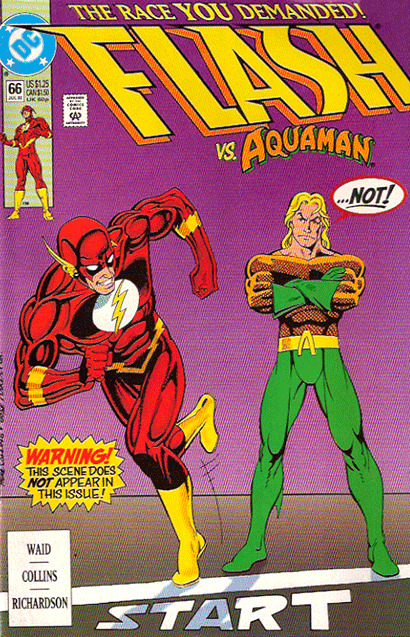 It was a fun little one off issue with a great spoof cover promoting “The Race Nobody Was Asking For” between The Flash and Aquaman. It probably has no larger bearing on the series as a whole. But it was still a fun one shot story that I wish more writers would embrace in the current comic landscape every now and then. 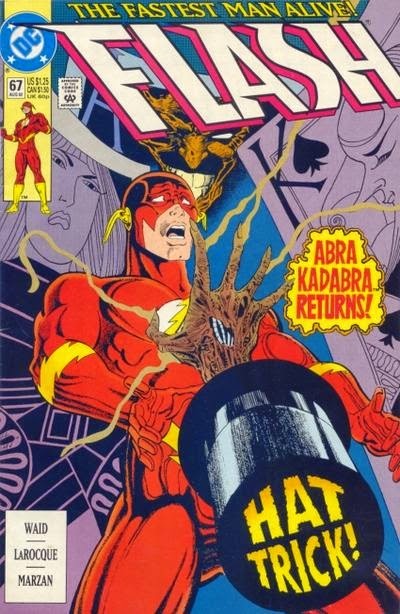 These two issues feature the villain Abra Kadabra returning from the dead after years of being “dead”. Abra is a villain from the far future that because of his advanced tech he is believed to be a really powerful magician. Abra Kadabra attacks a charity event that Flash is making an appearance at because there is a person using his name. But before the battle gets too involved a mysterious woman from Abra’s true time comes to take him back. 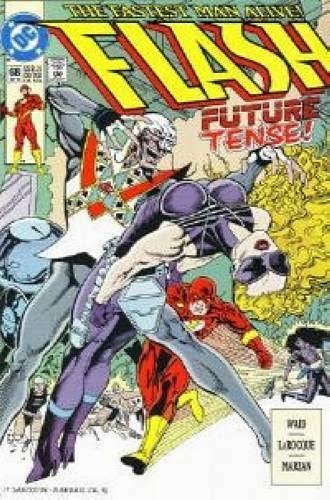 In the scuffle to return him to his proper time Flash gets sent to the future too. When they get to the future it is revealed that Abra Kadabra was exiled to the past where he could be in a time where there were more people like him to be with. But once they sent him back his followers started to revolt against the government even more. So they bring Abra back to his proper time in an attempt to calm his followers. Their plan is to kill him so that his death will convince the others that they can’t win. The real problem with this to Wally is that the future is controlled by a series of computers that control every aspect of the future civilizations lives. From their sleep time to the amount of time they are allowed to sleep. But what does a machine know about what humans need. So Wally, recognizing the irony helps Abra Kadabra escape his execution and takedown the machines running everything. Then he tricks one of the people into sending Abra back to the past and hitches a ride with him. Once back in his proper time Wally knocks out Abra Kadabra and takes all of his tech, leaving him powerless and insane. These two issues are a little more interesting to review. They are two installments in a four issue crossover with Green Lantern. 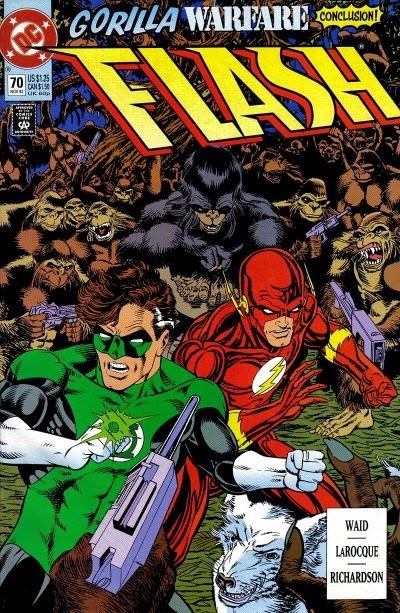 The two heroes team up to take on Gorilla Grodd and Hector Hammond. But I didn’t read the Green Lantern issues to the crossover. But I do know that your get to see cromagnun Green Lantern and Wally West with a head so big he can’t even run. These issues were the most forgettable of the ones I have read so far.